Workers at Croatia's largest shipbuilding group Uljanik on Monday held their second strike in less than two months, this time over unpaid salary for September. In late August, the workers downed tools because of uncertainty over payments for July and August. Those two months' salaries were secured after the government reached a deal with a local bank. Uljanik owns two docks, with some 4,000 workers, located in the northern Adriatic cities of Pula and Rijeka. Some 1,500 started a protest march on Monday through the streets of Pula. 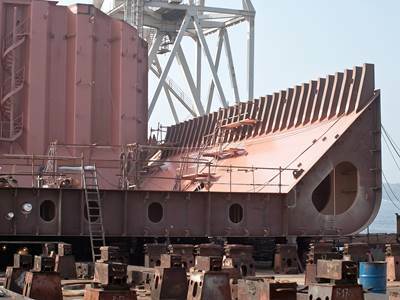 The shipbuilding group has had liquidity problems in the last 12 months. In January, the government helped it stay afloat with state guarantees for a loan worth 96 million euros ($111 million). Under European Union rules, no further state guarantees or direct payments from the budget are allowed. Earlier this year, Uljanik chose local firm Kermas Energija as its strategic partner and submitted a restructuring plan, which the European Commission rejected as inadequate. Management has yet to complete another restructuring plan. The chosen strategic partner reportedly aimed to convert part of the shipyard into a tourism business, drawing worker opposition. Economy Minister Darko Horvat said the government was also in contact with potential investors from Ukraine, Italy and the Netherlands. Finance Minister Zdravko Maric said last week the state might have to pay 4.2 billion kuna ($651 million) for the costs of state guarantees extended to Uljanik in the past. Workers control less than 50 percent of the company, with the state also being a minority shareholder. Other owners include several local banks and the country's top insurer, Croatia Osiguranje. Croatia's once-prosperous shipbuilding industry has struggled to survive since independence from Yugoslavia in the early 1990s. It has lost business to Asian shipbuilders, such as those in South Korea, missing opportunities to modernise and produce more sophisticated vessels. Phoenix International Holdings, Inc. hired Jack Herbert as its Commercial Operations Sales Manager in the Largo, MD office. V.Group, a global marine support services provider, opened its state-of-the-art new home in Mumbai in a ceremony earlier this week.